Please rest assured that MessagEase does not collect, nor store, ANY information about you, or any other of our users. NONE! We are in the business of providing the best keyboard for touch screen devices and nothing else. We have never been, nor do we plan to be, in the business of collecting, aggregating, or otherwise guessing, any information about our users. Our talent is focused, and our business hinges, on creating and enhancing the very best user interface for full text entry. Nothing else! Please note that MessagEase does not require any special permission. 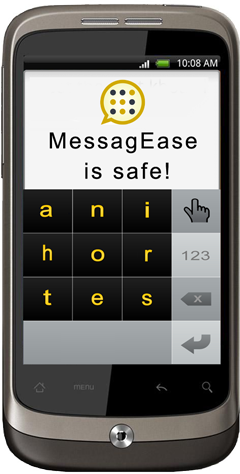 In particular, MessagEase does not seek Internet access permission. Nor does it seek permission to inspect your contact list, your calendar, or any other information that are deemed private to you. The "warning" you see when you first install MessagEase, or any other third-party keyboard for that matter, is Google's standard warning. Our unconditional pledge to you is that we'll NEVER read, use, store, or detect any information about you. I hope that our pledge alleviates your concern and you continue to experience and enjoy what we strive to make the best keyboard for touch screen and small devices. If not, please email us (support@exideas.com) and I will be glad to answer any question or fill you in on any detail regarding our goals, our code, and our policies regarding MessagEase and/or regarding your private information.